Just like people, dogs need to think about safety when near water. Sure, most of us are naturally good swimmers but that doesn’t mean you shouldn’t take precautions. I myself have found myself happily jumping into a stream only to find the current too strong. A dog might also “run out of gas” while swimming. A life jacket can save a dog’s life. I have my own life jacket or flotation device. It’s designed for us dogs so after some minor adjustments, it fits me right. It’s brightly colored so I’m easy to spot & it has a ring to hook my leash to as well as a handle should I ever need to be lifted out of the water quickly. Just as you would with a small child, it’s important to have an eye on your good dog at all times when playing near or in the water. It can only take a moment for a dog to find itself in trouble. A dog could get it’s feet tangled in underwater weeds for example. 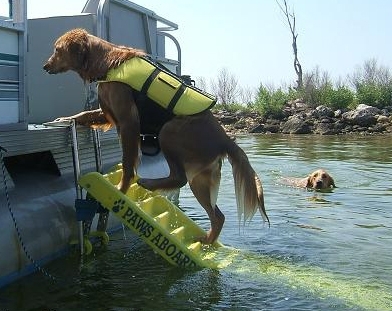 In a boating accident, a dog could be injured & unable to swim. Also don’t over do it, a dog can tire before you do. Allow rest time, under a shady tree perhaps. Be smart, be safe & have a wonderful swim. A good article with tips on how to choose the right life jacket & some recommendations can be read here. Bentley and Pierre have never been in the water but our other dogs have had life jackets.